This foundation course is designed to teach candidates with little or no previous experience how to strip, service and reassemble all types of locks fitted to modern motor vehicles. Our students will understand the workings of the lock and therefore how to open them when no keys are available. They will be taught how to cut and decode keys, learn about diagnostics & transponders and experience first hand the latest equipment and technology available. We aim to provide you with the solid grounding you need to start and run your locksmith business correctly from day one. The course offers intensive training over a 5 day period with a maximum of 6 students per course. The course is 90% practical to ensure you know how to put the theory into practice. Upon completion of the course you will have the ability to start practicing as a knowledgeable Auto locksmith and have an in-depth ability to work on the vehicles trained on. You will also receive a detailed instruction manual and training certificate. 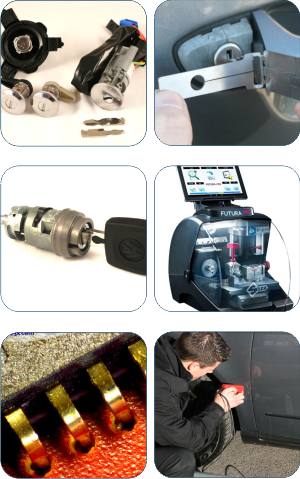 Within the training course you will have the chance to see and use the very latest state of the art equipment available to the modern Auto Locksmith, including key programming, cloning and eeproming equipment. Additional training on Key & remote programming, transponder cloning and eeprom programming are suggested to complete your training program to become a complete Auto Locksmith. The Auto locksmiths foundation course is a popular course suitable for those with little or no experience in the Auto Locksmith trade. It is ideal for current locksmiths not involved in the Auto market, Motor trade operations that want to offer Auto locksmith services and people looking for a career change into a niche market with a high level of technical content and good rewards.